Am I starting to freak out? I have a little over two weeks to finish a shawl I'm planning on gifting to the Kiddo's teacher and I'm nowhere near where I thought I would be at this time. I had to take a few days off from knitting because I could feel my hands starting to act up a smidge, and rather than wait for them to be in complete pain I thought I would nip it in the bud and take it easy now. I think it worked. 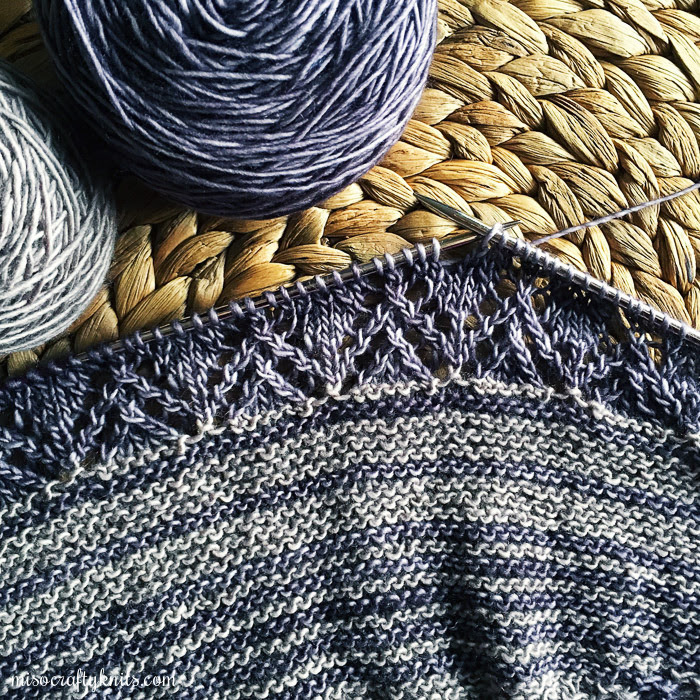 And so my plan for the rest of the week and most likely the weekend is to work solely on this shawl. I will get it done. It needs to be done. The shawl is actually lovely to knit. I am a little concerned about the depth of it but have to remind myself that I still have two more lace panels to knit up. Plus, I'm not the one that will be wearing it so I shouldn't be so picky, right? I'm also slightly concerned about the amount of yarn I have for the main colour, which is ridiculous considering that I have at least half a skein and only one more section to go before starting the border. But I do this to myself all.the.time. My brain likes to mind play games with me and makes me assume I'm going to run out of yarn, only to have more than plenty leftover by the time I bind off that last stitch. These mind games are at its worse when the colourway I'm using is either not available at my LYS, is limited, or is by a dyer that no longer dyes yarn. It's a messed up game and one that is played a lot. My goal is to use up as much of the main colour yarn as possible and have been adding in extra rows here and there - more for the distribution of the stripes than to add length, but now I'm considering adding a few extra rows in the last two lace panels to gain more depth. Depending on how it all looks, I'm also thinking of doing lace-y picot edge bind off to give the shawl a little more "oomph". I just hope I can get the shawl finished before the week is over, cause I really want to finish the mittens I had cast on a few days ago. These are not for gifting. It's been crazy cold lately and I can't seem to find a single mitten from last year. I have, however, been able to locate all the fingerless mitts that I've knitted up in my lifetime. 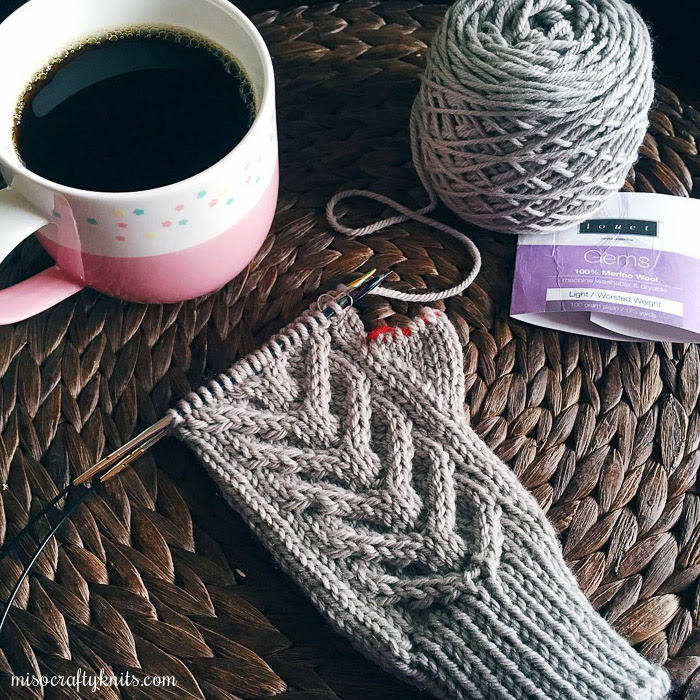 In case you're wondering, the pattern is Antler Mittens by Tin Can Knits and the yarn is Louet Gems Worsted. I've never used this yarn before and I have to say it's absolutely lovely. It's so soft, the shade of grey is perfection, and the stitch definition...oh my!! But I told myself that I can't finish this selfish knit until a gift knit is completed. So...back to shawl knitting I must go! I absolutely LOVE the misty grays in that shawl. Gorgeous! How on earth are you going to give it away when it's done? (Sorry - shouldn't have given you something else to worry about.) The mittens are great too. The shawl is stunning Melissa! I love the subtle striping. And those mitts! Swoon!